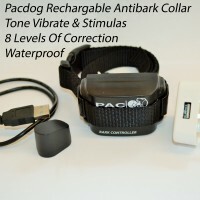 As official UK stockists of PAC electric remote training products, we can offer specific solutions for dog owners, including the anti bark collar. These bark collars are capable of producing stimulus, vibration and sound correction. By purchasing a dog bark collar from us, you can make good use of this sophisticated system that can be used to train a dog in relation to excessive barking. The easy-to-use kit contains all you need to set up the system, with instructions on how to use the anti bark programmes to discourage an ongoing barking issue.